and Gulf of Mexico (fig. 4-11), mild temperatures, high humidities, and cloudiness are found, especially during the night and early morning. This is the characteristic weather found in mT air in the absence of frontal conditions. The stratus and stratocumulus clouds that form at night tend to dissipate during the middle of the day and fair weather prevails. Visibility is generally poor when the cloudiness is present; however, it improves rapidly because of convective activity when the stratus clouds dissipate. The ceilings associated with the stratus condition generally range from 500 to 1,500 feet, and the tops are usually not higher than 3,500 to 4,500 feet. Precipitation does not occur in the absence of frontal action. With frontal activity, the convective instability inherent in this air is released, producing copious precipitation. If mT air is forced over mountainous terrain, as in the eastern part of the United States, the conditional instability of the air is released at higher levels. This might produce thunderstorms or at least large cumuliform clouds. (See fig. 4-12.) Pilots must be aware that these clouds may develop out of stratiform cloud systems and therefore may occur without warning. Icing may also be present. Thus, in the Great Lakes area, a combination of all three hazards (fog, thunderstorms, and icing) is possible. Occasionally when land has been cooled along the coastal area in winter, maritime tropical air flowing inland produces an advection fog over extensive areas. (See fig. 4-13.) In general, flying conditions under this situation are fair. Ceilings and visibilities are occasionally below safe operating limits; however, flying conditions are relatively smooth and icing conditions are absent near the surface layers. As the trajectory carries the mT air northward over progressively colder ground, the surface layers cool and become saturated. This cooling is greatly accelerated if the surface is snow or ice covered or if the trajectory carries the air over a cold-water surface. Depending on the strength of the air mass, fog with light winds or a low stratus deck with moderate to strong winds forms rapidly because of surface cooling. Occasionally drizzle falls from this cloud form; and visibility, even with moderate winds, is poor. Frontal lifting of mT air in winter, even after the surface layers have become stabilized, results in copious precipitation in the form of rain or snow. 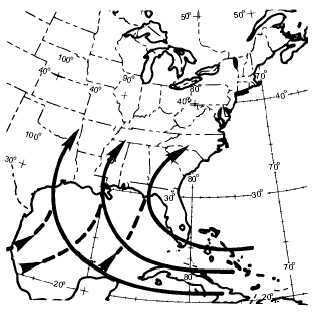 4-12 AG5f0411 mT mT Figure 4-11.Trajectories of mT air over the Atlantic in winter. WATER TEMP. 20 C. O GULF OF MEXICO SW NE APPALACHIANS AG5f0412 10 C. SURFACE TEMP. 0 C. O O STRATUS mT CUMULONIMBUS Figure 4-12.mT air moving northeastward.